Bill Mayher offers some practical advice on college admissions in this work. As the father of a “rising senior,” I have two major objectives during the next year: help Aidan get into college and figure out how pay for his education. These two topics will occupy much of my reading, and, presumably, blog writing during at least the next couple of weeks. Fortunately, I have a lot of resources from which to choose. 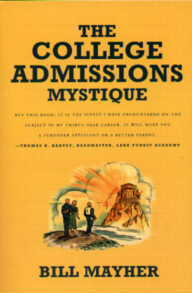 I began this part of my parental education with Bill Mayher’s The College Admissions Mystique. In addition to having an attractive yellow cover with a laudatory blurb from the headmaster of Lake Forest Academy, the book also has a back view of a son walking away from his parents, who stand arm-in-arm, and toward the Olympian college he will attend (The Greek-looking building is back-lit by the sun in a way that would make Apollo envious. ).